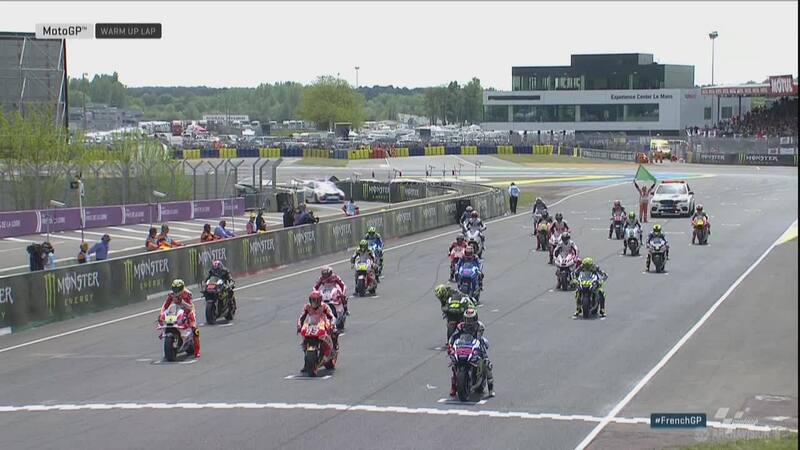 Tension hung in the air ahead of the 28-lap Monster Energy Grand Prix de France as riders in the MotoGP™ World Championship sat patiently on the grid. 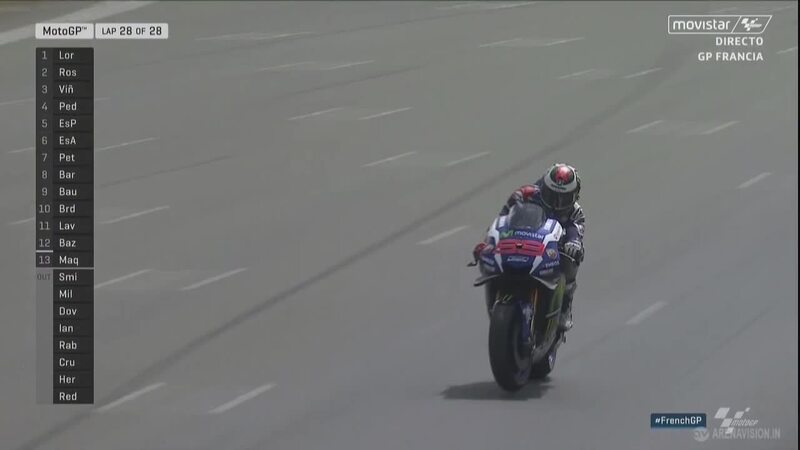 Jorge Lorenzo (Movistar Yamaha MotoGP) had pole ahead of championship leader Marc Marquez (Repsol Honda Team) and potential podium challenger Andrea Iannone (Ducati Team). Gusts of wind blew across the track as they departed for the Warm Up lap. 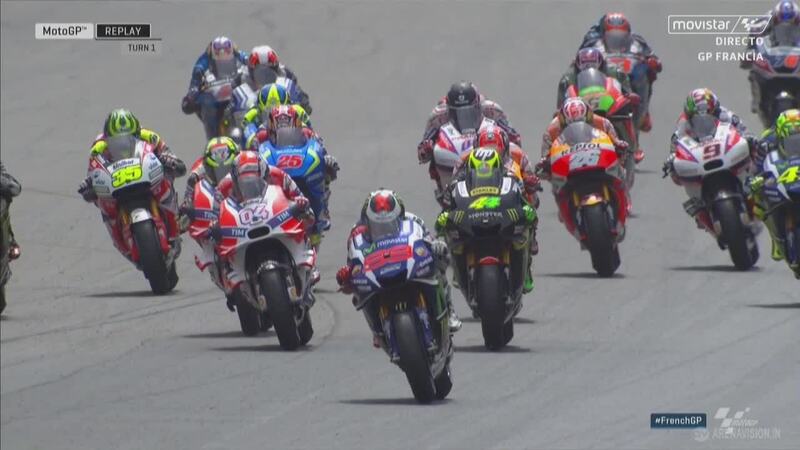 Lorenzo made a perfect start as Marquez wheelied off the line, the Yamaha rider leading through the first chicane with Andrea Dovizioso (Ducati Team) behind him. 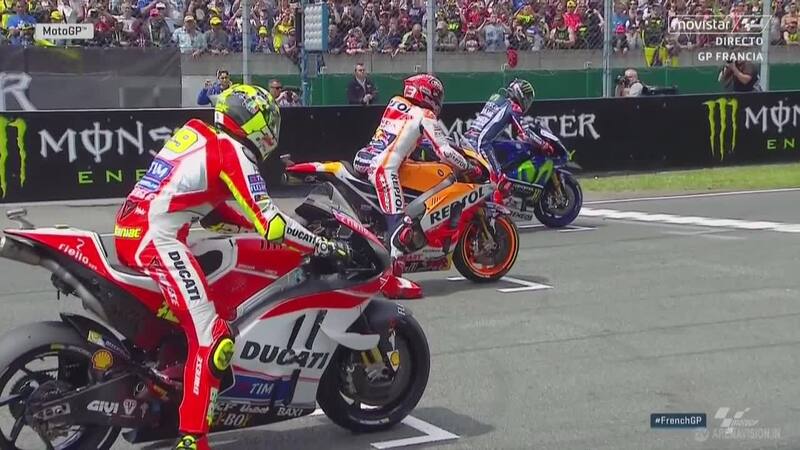 Marquez was soon up to fourth as he charged past Pol Espargaro (Monster Yamaha Tech 3), Valentino Rossi (Movistar Yamaha MotoGP) attempted to follow him through but found himself swamped by the likes of Aleix Espargaro (Team Suzuki Ecstar) and Bradley Smith (Monster Yamaha Tech 3). As they crossed the finish line for the first time Lorenzo’s lead stood at half a second with Dovizioso and Iannone behind. It was not the start Rossi had wanted, able to make up just a single place from seventh on the grid as the second lap began. Dovizioso, who had seemingly banished his recent bad luck, remained strong in second. Having started last on the grid, home rider Loris Baz (Avintia Racing) was up to 17th by the fourth lap of the race. Home fans cheered him on with each pass, urging the Frenchman forever forward. 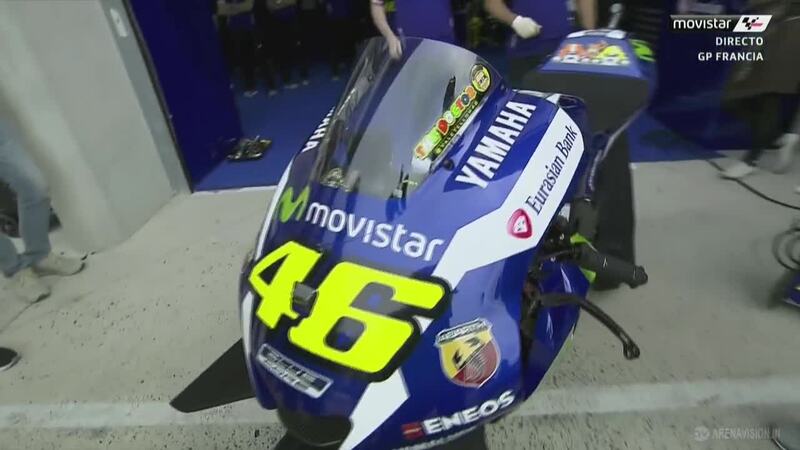 Lap four saw Rossi improve his pace, going half a second quicker than his rival Marc Marquez who was just ahead. The pair weren’t the only ones closing up, Iannone also making significant progress on his teammate. His charge would be halted on lap seven when Iannone fell at Turn 8. Iannone’s fall was followed soon after by Cal Crutchlow (LCR Honda), who suffered his fourth race crash of the year. One lap later, fellow satellite Honda rider Tito Rabat (Estrella Galicia 0,0 Marc VDS) came off at Turn 6. Iannone would re-join the race but eventually retired. Lap 13 saw Rossi slip past on Marc Marquez, making it a three-way battle for second as Lorenzo continued to run away at the head of the race. Just a few corners later Rossi was up into second place and matching Lorenzo’s times. A thrilling battle for second was brewing until on lap 16 at Turn 7 both Andrea Dovizioso and Marc Marquez crashed at the same time. There was no contact between them, the pair both losing the front in synchronisation. Now Maverick Viñales (Team Suzuki Ecstar) was on course for his first MotoGP™ podium and Lorenzo on the cusp of taking the championship lead. The falls continued and soon Marc Marquez was up in 13th place, despite missing a large section of his side fairing. 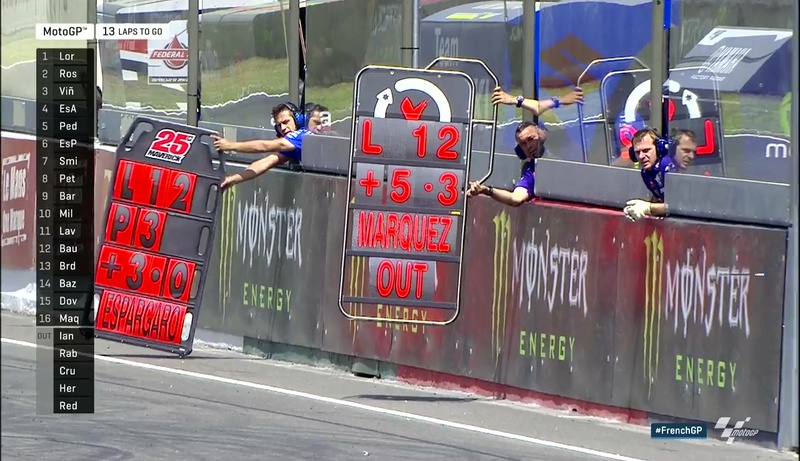 Lorenzo, 7.8 seconds clear with five laps to go, was having no such issues as he calmly ran his own race. With gaps of at least three seconds splitting the top three, each eased their pace to guarantee a finish in the clearly difficult conditions. For the second time in 2016, Jorge Lorenzo crossed the line in first place after dominating the French GP. 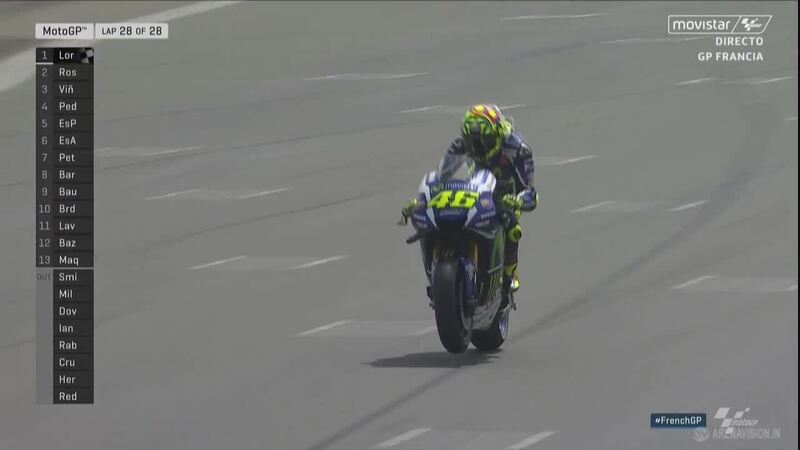 Over ten seconds would separate him from Rossi as the race came to an end. It was a day of celebration for both Suzuki and Viñales, the Spaniard taking his first podium finish in the premier class. Viñales’ podium is the first for Suzuki since the 2008 Czech GP, making amends for his mistake in Argentina. Victory sees Lorenzo move to the top of the championship with 90 points, Marquez forced to concede his advantage after the crash. 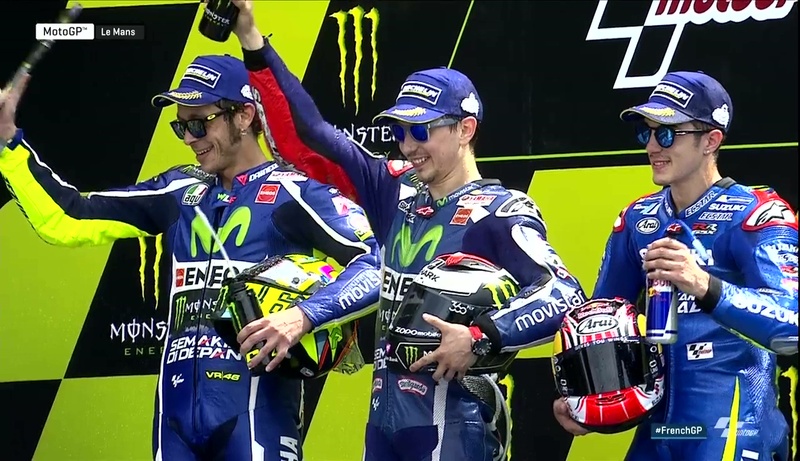 Rossi stays third and is 12 points behind Lorenzo. Marquez, Lorenzo and Rossi now have a mistake each to their name and with only 12 points between them in the championship; the season is only just getting started. The MotoGP™ World Championship now heads to Mugello, Rossi’s home round but one where Lorenzo has been the man to beat in recent years. Once again it looks set to be a thrilling weekend in the Tuscan hills. Dani Pedrosa (Repsol Honda Team) was unable to close the gap to Viñales despite his best efforts and settled for fourth. Pol Espargaro was once again the fastest Independent Team rider as he ended Tech 3’s home round in a credible fifth ahead of his brother. Aleix Espargaro (Team Suzuki Ecstar), Danilo Petrucci (Octo Pramac Yakhnich), Hector Barbera (Avintia Racing), Alvaro Bautista (Aprilia Racing Team Gresini) and Stefan Bradl (Aprilia Racing Team Gresini) completed the top ten. 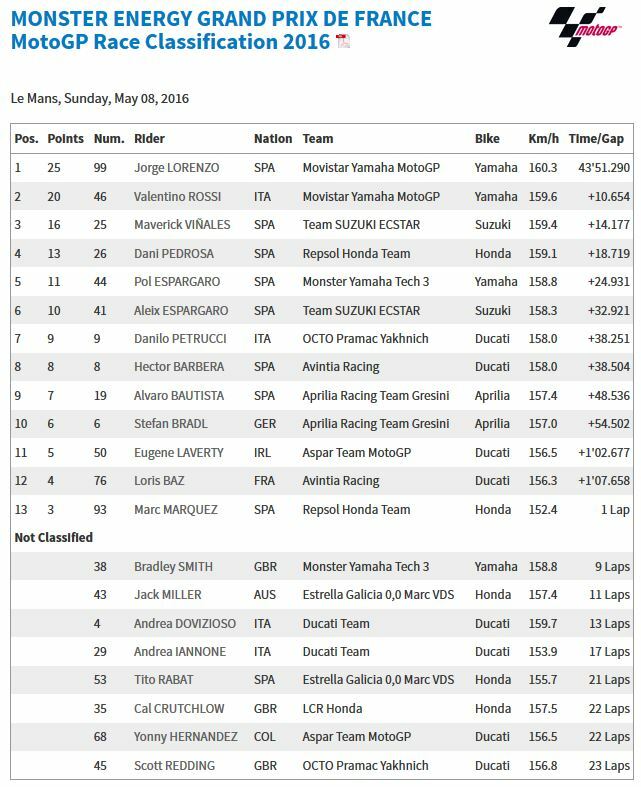 Of the 21 riders on the grid, 13 finished the race. 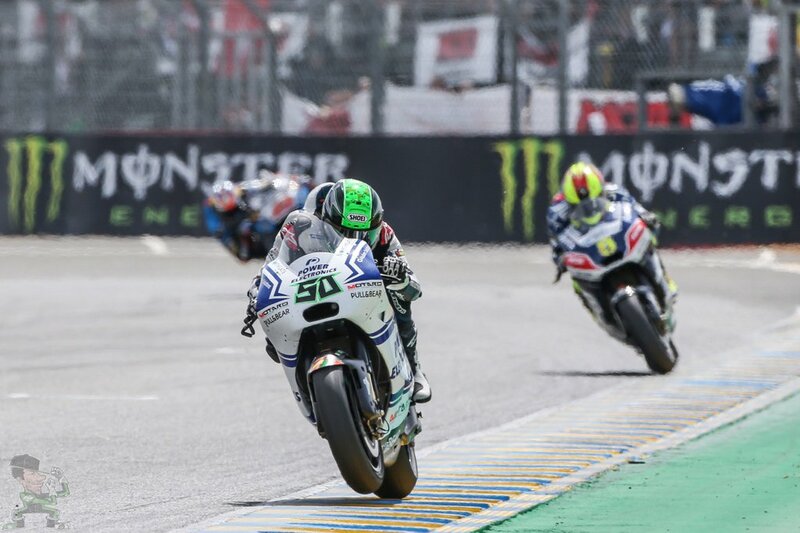 Scott Redding (Octo Pramac Yakhnich) retired from the race early on, followed by Yonny Hernandez (Aspar Team MotoGP) who crashed from the race on lap seven. While running inside the top ten, Jack Miller (Estrella Galicia 0,0 Marc VDS) suffered a fall, the French GP a war of attrition. Turn 7 claimed yet another victim as Bradley Smith crashed out of his team’s home race. 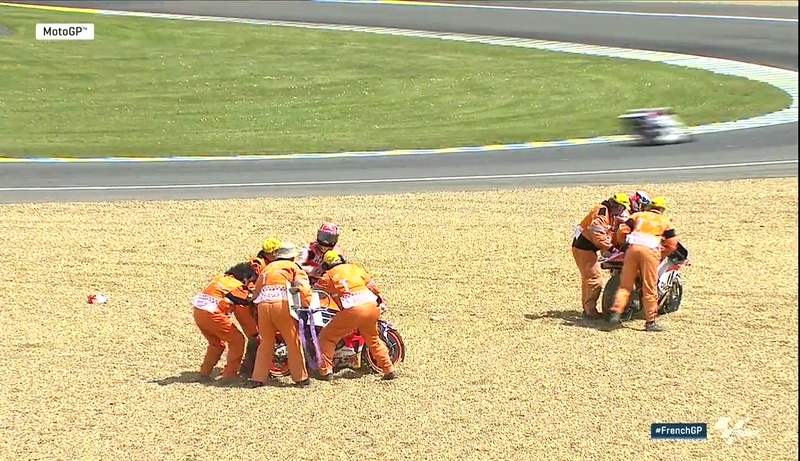 Just when things looked to be going well for Andrea Dovizioso, he fell from a potential podium finish in Le Mans. 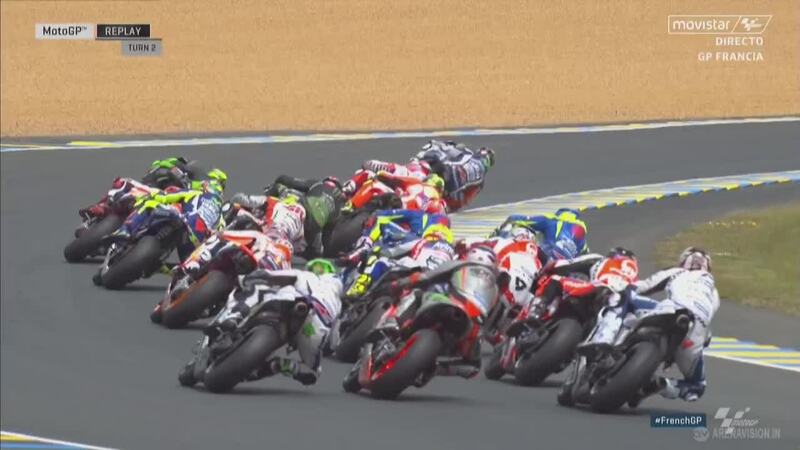 The French GP was a gruelling race for riders in the MotoGP™ World Championship, just 13 finishing after a number of crashes. Unfortunately Andrea Dovizioso was one of those who failed to finish, the Ducati Team rider in contention for the podium before sliding off. 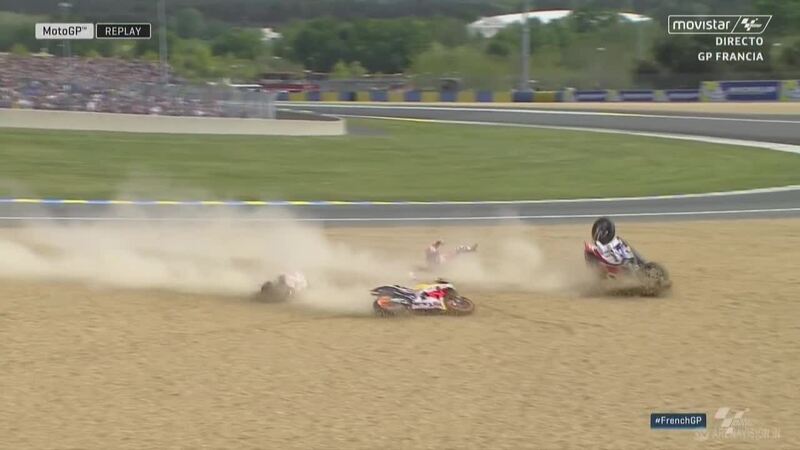 He and Marc Marquez (Repsol Honda Team) fell in unison at Turn 7, losing the front end at the exact same time. Before this Dovizioso had been showing well, fighting with Marquez and Valentino Rossi (Movistar Yamaha MotoGP) for a potential podium position. This is the third straight race Dovizioso has failed to finish, and the fourth where a crash or technical issue has hampered his performance. While many may have lamented what could have been, Dovizioso again looked at the positives. His performance proved that both he and Ducati can run at the front, but work still needs to be done over race distance. 23 World Championship points have the Italian in 11th overall, two points behind his teammate who has had an equally difficult start to 2016. 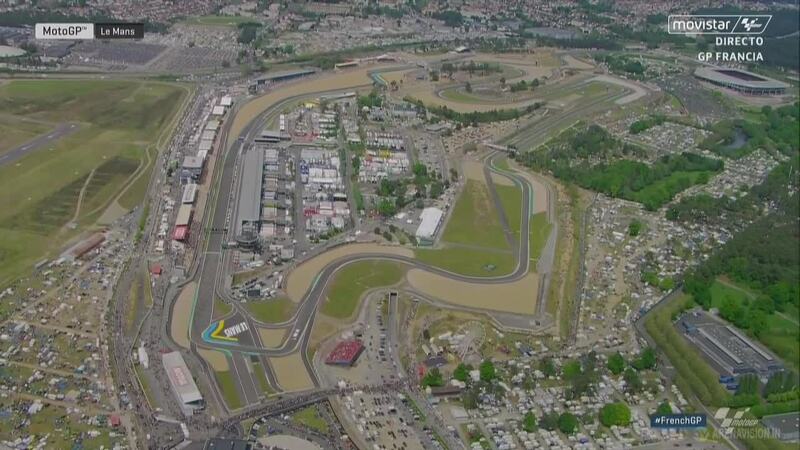 The sixth round of the MotoGP™ World Championship will take place in Mugello, the home of both Dovizioso and Ducati. Marc Marquez crashed out of fourth place at the French GP, remounting to finish in 13th but relinquishing his championship lead to Lorenzo. 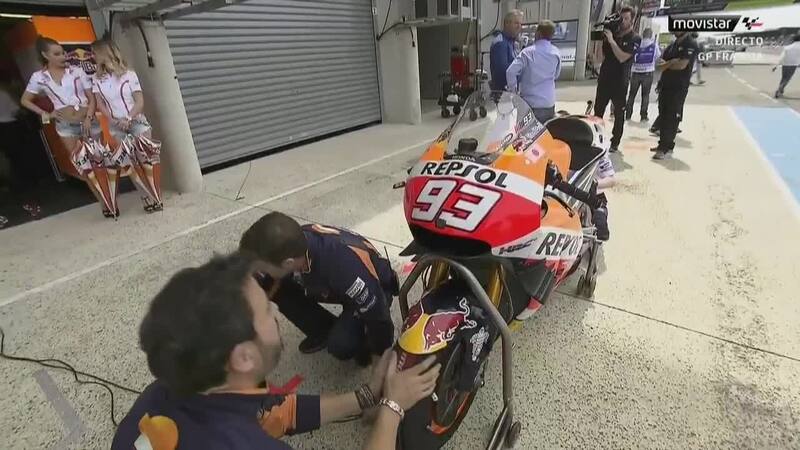 Marquez started from second on the grid but got bogged down at the start of the race, before recovering to fourth by the end of the first lap. Try as he might, he could not make a dent in the gap to the leaders. 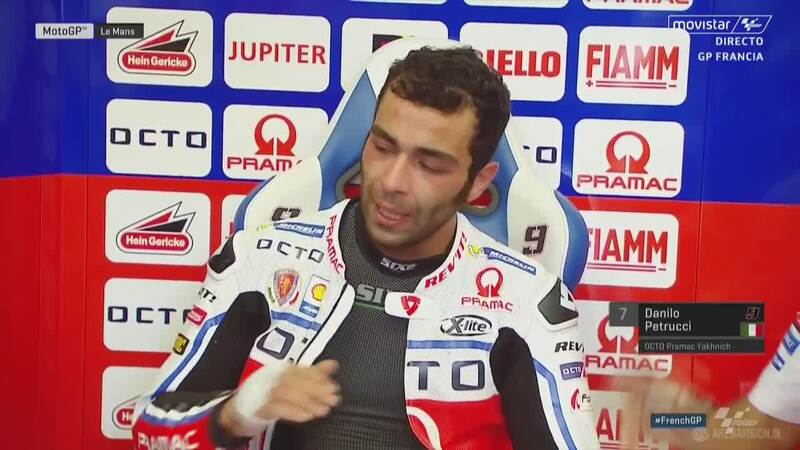 Suddenly Andrea Iannone (Ducati Team) crashed out of the race on lap 7 to promote the Spaniard into third. 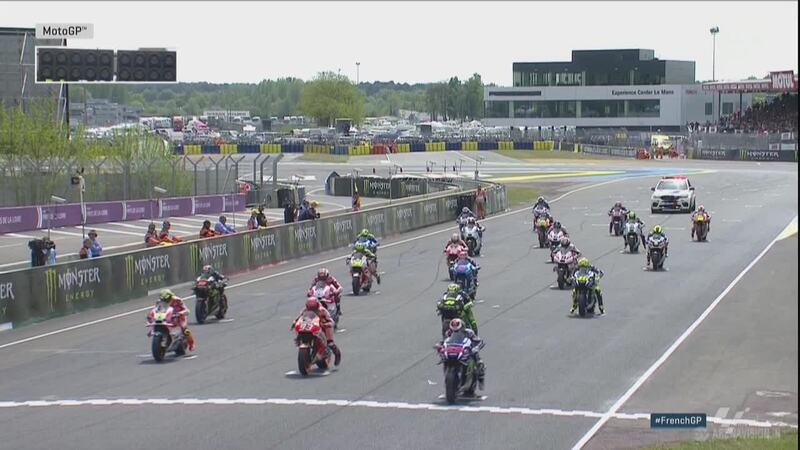 With 16 laps to go, Marquez’s hard front tyre choice was coming into its own and he had managed to catch the second placed Andrea Dovizioso (Ducati Team), although Valentino Rossi (Movistar Yamaha MotoGP) had also become embroiled in the battle for the podium at this point. Marquez will be looking to bounce back at the Gran Premio d’Italia TIM, which takes place from the 20th to the 22nd of May. Valentino Rossi is just 12 points behind his teammate Jorge Lorenzo in the standings after his charge to second at the French GP. Rossi was simply on fire at the French GP, fighting his way from seventh on the grid to secure his 178th premier class podium. ‘The Doctor’ had a poor start from the third row but quickly moved into sixth position before getting involved in a scrap with Monster Yamaha Tech 3 duo Pol Espargaro and Bradley Smith in the opening laps. 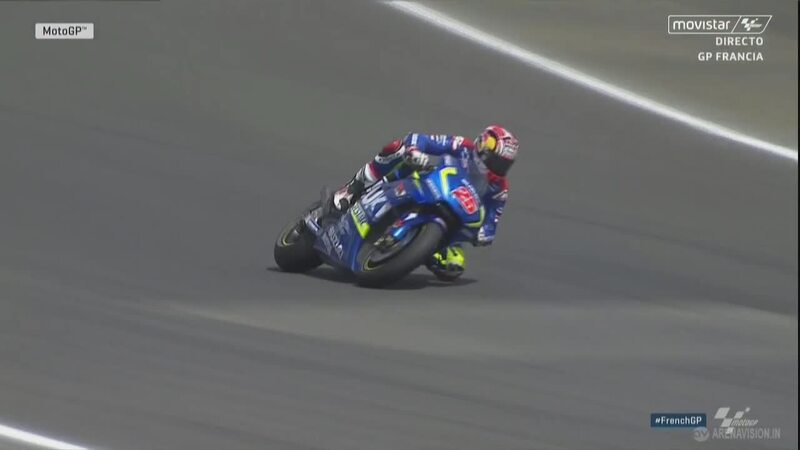 After muscling his way past his fellow Yamaha riders with strong but fair passes, he quickly went on to take fifth place from Aleix Espargaro (Team Suzuki Ecstar) after the third lap. 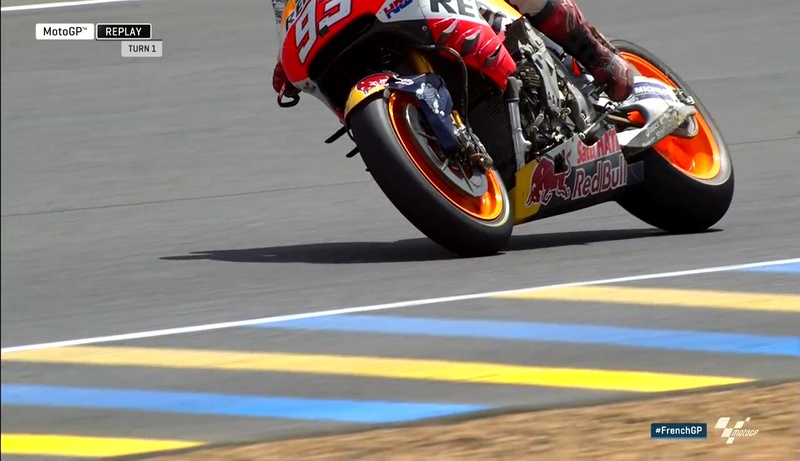 The nine-time World Champion then set his sights on Marc Marquez (Repsol Honda Team) and increased his pace as he closed down the 1.3 second gap to the championship leader, posting a 1’33.293s, the fastest lap of the race. With 20 laps to go Rossi moved up to fourth place as Iannone crashed out, which spurred Rossi on to fight for a place on the podium. Having saved his tyres, he lined up his Spanish rival and under loud cheering from the fans he made his move in the Garage Vert corner on the next lap. Now in his element he overtook his next target, Andrea Dovizioso (Ducati Team), up the inside in Musée corner. 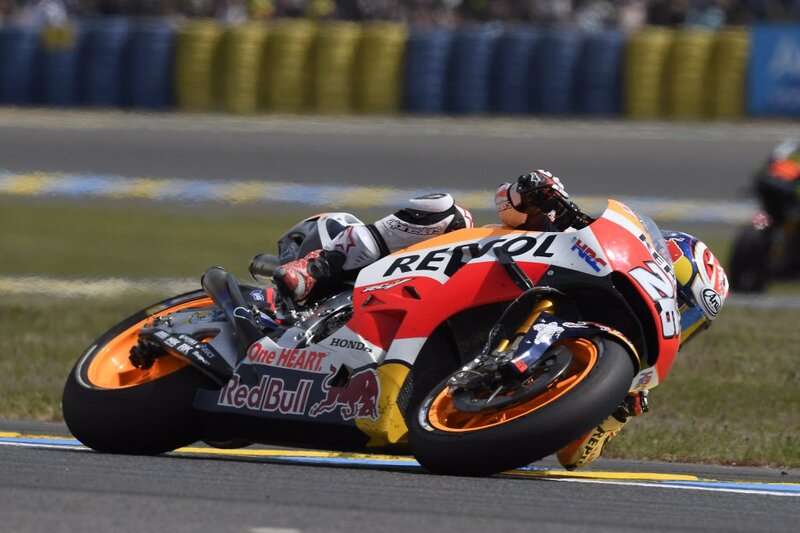 Though he was unable to stretch his lead when in second place, he kept pushing his YZR-M1 to the limit until Marquez and Dovizioso got caught out in Turn 7 while trying to keep up with his pace. With twelve and a half laps left to go, Rossi was no longer under pressure. Unable to close in on his teammate, who had a gap of more than 5.2s, he focused on managing his advantage over Maverick Viñales (Team Suzuki Ecstar) in third place and landed a second consecutive podium finish, taking the chequered flag 10.654s behind his teammate. This meant that it was the second conseictive race that the factory Yamaha had achieved a 1-2 after Rossi’s victory last time out in Jerez. 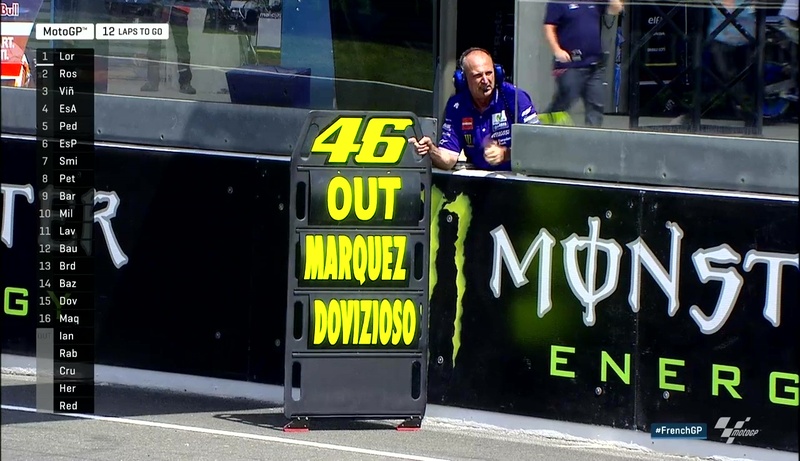 This now means that Rossi (78pts) is just 12 points behind his teammate Jorge Lorenzo (90pts) who leads the standings and just 7 points behind the second placed Marquez. Rossi is in a strong position as he heads into round six of the 2016 MotoGP™ World Championship at Mugello, the Gran Premio d’Italia TIM, which takes place from the 20th to the 22nd of May.